Áåñïëàòíî ñêà÷àòü êíèãó The Sniper at War. From the American Revolutionary War to the Present Day ÷åðåç òîððåíò. Nothing chills the blood of a soldier on the battle field more than the crack of a rifle shot and the cry of "Sniper!" A skilled sniper can stop even large units in their tracks and damge the enemy's morale. 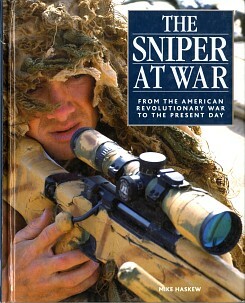 The Sniper at War looks at the impact and role of the sniper from the American Revolutionary War to the present day. From the very beginning, snipers risked their lives for the chance of a clean "kill." Haskew looks at how the art of sniping in war has become more professinoal and specialized, with dedicated training courses and equipment. Famous snipers throughout history are profiled, such as Vasili Zaitsev, a hero of the battle of Stalingrad, with testimonies from individual snipers who took part in modern conflicts from Vietnam to Afghanistan and the Gulf.